In case you are thinking of becoming a welder in Utah, you should know that there are lots of welding training programs in the state. 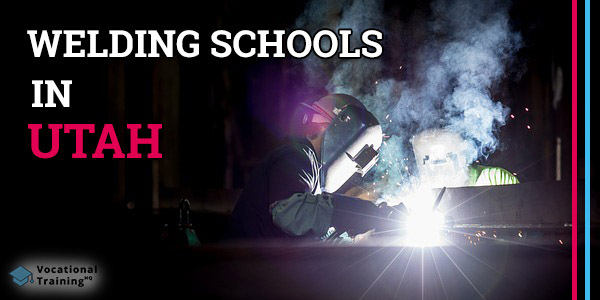 You can find the list of the best welding schools in Utah in this article. Moreover, there is a bunch of useful facts and tips that help you to understand better this career. 1.1 How Much Time It Is Necessary to Complete Welding Training in Utah? In case, you are thinking about becoming a welder in Utah, you need to learn some important aspects. Learn some basics about the welding process. In order to understand the job better, watch some videos and read articles about welding. Also, if you have some friends and relatives working in the sphere, it will be a good idea to ask some questions. Reveal and evaluate your personal strengths. To work as a welder, you need to be strong and healthy. Also, there are some personal characteristics that are absolutely important. You should have excellent spatial orientation skills and manual dexterity. Moreover, you should be able to work independently and even have some artistic skills. If you don’t have at least most part of these features than welding can be not the best career for you. Nevertheless, if you have a determination then it can be not an issue. Choose the best training program. As soon as you’ve made a decision to become a welder, you need to look for the best program that suits your preferences. In this article, you can get info about the best welding certification schools in the state. Get your certification. To become a welder, you need not only to complete your training but as well pass the test in order to get your certification. Consider the fact that it should be taken at an accredited welding testing facility. Maintain your certification. After getting your certification, you should maintain it constantly. In order to do it, you need to fill out certain paperwork twice a year. Look for better career options as soon as you get enough experience. To make it easier, you need to get a higher degree which means that you should continue your education. For example, you can become a Senior Certified Welding Inspector. How Much Time It Is Necessary to Complete Welding Training in Utah? It’s clear that any student wants to know how much time they need to train before starting their career. In fact, there is no certain answer to the question as the duration varies depending on program specifications. Nevertheless, you should know that your welding training won’t take more than 2 years. In this section, there is a list of the best welding certification schools in Utah. In this table, you can find not only the names of facilities but their contact info as well. was approved by the American Welding Society’s SENSE Accreditation Program. provides such essential classes as Gas Tungsten Arc Welding (TIG), Shielded Metal Arc Welding (stick), or Gas Metal Arc Welding (MIG). Welding has an incredible outlook all over the USA and Utah is no exception. According to the US Bureau of Labor Statistics, the number of jobs for welders will grow by 6% until 2026. Working as a welder in Utah you can earn a good salary. A median salary of a welder throughout the country is about $39 390 a year or $18.94 an hour. At the same time, welders in Utah earn a median salary of $44 760 per year or $21.52 per hour. Speaking of the top 10% of welders, in Utah they earn about $72 580 while throughout the country – $62 100 annually. If you don’t feel like becoming a welder but still, looking for some similar careers, there are some options for you. As you see, welding is a challenging but at the same time absolutely rewarding career. Moreover, you don’t need something extraordinary to become a welder. Just take your time to learn about available programs and choose the one you like.